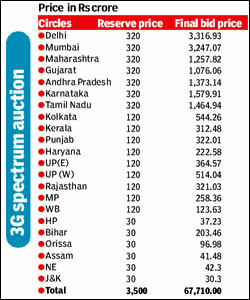 The 3G auctions, that ended on Wednesday with a peak investment of roughly $14.6 billion, has come as a relief to the cash-strapped government, but has drawn mixed reactions from the analyst community. While one set of analysts believe the total price at a company level isnt exorbitant, others sensed it as a huge burden on the balance sheet of the telecos. Analysts expect a turn around period for the investment to be around 4-5 years, with an additional capex of $5-6 billion in rolling out the services. However, the fact that of the nine operators that bid for 22 circles, none have been able to acquire pan-India spectrum, has indicated that telecos did focus on circles with a strong presence. An analyst with a multinational bank said, The telecos have been quite disciplined and the prices for the circles other than Delhi and Mumbai have been in line with expectations. Naresh Chandra Singh, analyst at Gartner, expressed similar thoughts. Considering the licence is going to be for the next 20 years the telecom players seemed to have bid in line with the expectations. Though we expect a short term impact on the margins but as the size of the Indian market grows we feel its a fairly priced auction, he said. While focus on the B&C circle are expected to an attractive market for telecom players like Bharti Airtel and Reliance Communications. The B & C circles could bring a turn around if only the price market is right and the entry barrier of 3G enabled handsets is overcome, Prashant Singhal, telecom industry leader with Ernst & Young, said. However, an investment of $ 21-22 billion in the industry over the period of next one year is expected to bring an impact on the balance sheet. We expect a break even period of about five years, he added. Also, Harit Shah, telecom analyst with Karvy Stock Broking, said, Considering the operators were spectrum starved, they had to bid high. We were not expecting a pan-India bid, as operators were focusing on circles, revenue, markets etc It is going to be a fairly long gestation period, the companies should take roughly 3-5 years to earn back their investments."